The New York Times reports on the work of World Weather Attribution scientists and explains how CPDN simulations are used to make real-time assessments of the role of climate change in extreme weather events possible. Using the example of the recent real-time study on the floods in France and Germany the article details how we conduct the research, what decisions need to be made and what is the motivation behind such studies. 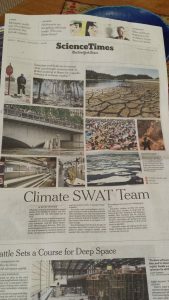 Under the title “the Climate SWAT team” the article was also published on the fron page of the science part of the printed version of the newspaper.